Our standout blogger, Cassadie “Sadie” Armstrong, saw an article with an accompany photo in her local newspaper paper this summer that, well, let's just say didn't go over well with her. "This photo," she says, "shows the difference between the coverage between the boys little league and the girls little league when the boys won a smaller tournament and the girls won the state championship. Boy, was I mad!" Sadie explains it got her thinking about "fences" and how they, particularly in her neck of the country, are another example of the inequality of gender support when, ironically, the lack of fences in softball can be more limiting than having them! 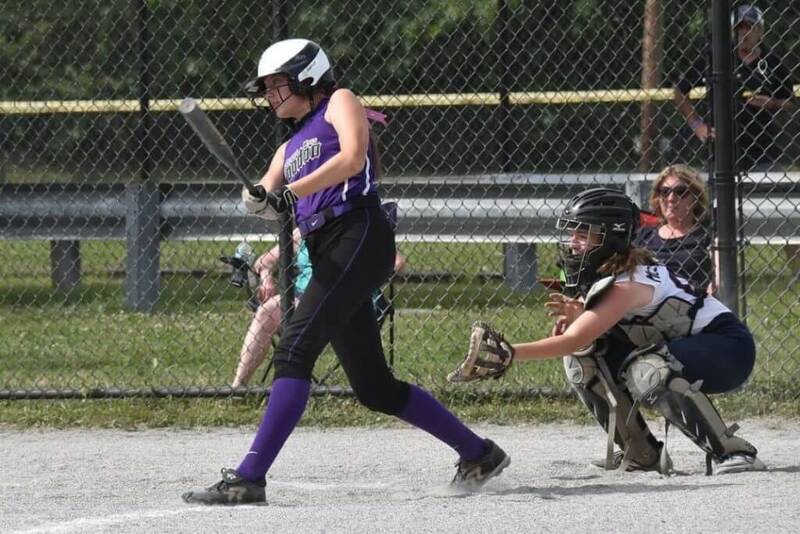 Sadie is a 5-foot-10 pitcher/infielder 8th grader from Portland, Maine who plays for Central Mass Voodoo 14U and is becoming one of the most accomplished players in the Class of 2023. 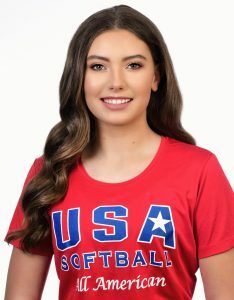 Sadie was a repeat USA Softball All-American this summer. Sadie’s honors already have included being named a two-time All American by USA Softball, a member of USSSA Elite Select Futures and chosen as a Pre-Season Rookie by Under Armour Softball Factory thanks to a 62 mph screwball and a 61 mph dropball with consistent ball exit velocity speeds in the high 60s to low 70s. 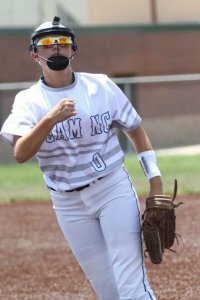 This summer she led her USA All American Northeast Region One team to a 5th place finish at the USA Softball All-American Games with a 0.00 ERA and at the World Fastpitch Championship she guested with Team NC and pitched well against elite competition. I clicked on GameChanger.com one morning this summer and my batting stats looked pretty good. I had enough at-bats so that when someone looked at my average, they knew I am not just a fluke, but that I am consistent and predictable in my ability to produce a hit. On occasion I have event been clutch! Yessssssss!!!! My worst at-bats typically still put the ball into play and force the defense to make the out. Sounds pretty good, right? Well, if you are a contact hitter, sure; however, there is one stat that every power-hitter likes to see: home runs. My home run stat, though, is not the same as it is for kids who play on fields that have fences. I could smash a bomb 220 feet and it could still be caught or limit me to a double based upon where the defense plays in the outfield or how fast of a baserunner I happen to be. I have heard coaches proclaim to their power-hitters that it does not matter how fast you are on the bases if you hit it out. Sadie admits she's not too keen of wearing the title of Queen of the World's Longest Double (although she is seen here hitting a home run!). On a fenced field, that same 220 foot shot is totally gone! I would be taking my victory lap and being greeted by celebrating teammates at the plate. Instead, I get to be Queen of the World’s Longest Double (or sometimes, even a single if it is to right field). I don’t like the title and I don’t like my home run stat because it does not reflect my ability and I REALLY dislike that I frequently play on softball fields where there is no fence so I cannot fix this problem by virtue of my hard work and effort. Maybe you don’t think that lacking a fence is a big deal, but consider this: when I am being assessed by prospective coaches and college teams, my statistics are going to be compared to kids who DO play on fields with a fence. And they get the benefit of having legit home runs instead of the equivalent of an asterisk after the stat --- as though my hit was less significant because there is no boundary to differentiate between an over-the-fence missile and the same hit that was sent to a girl playing deep and getting the ball in. How about the opposite when some teams actually don’t differentiate between an over-the-fence home run and a little league style home run where the fielders are just chasing a rolling ball through the short, mowed grass? Consider this, too: by not having a fence, I am lacking feedback about my performance. I am certainly not going to go on social media, posting photos of a groundball home run that was chased down and call it a home run, although plenty of people do that. Naw, that isn’t a homerun. It was a great hit and you advanced on the throw. I want to feel the exhilaration of launching the ball over the field’s outermost boundary and know that I achieved that instance of perfection! Softball is not a game that has a lot of perfect moments, but man….when it does, this sport is beautiful. It is less perfect and less beautiful when you can’t hit a real home run or prevent someone else from doing the same against you because you don’t even have a fence on your field. 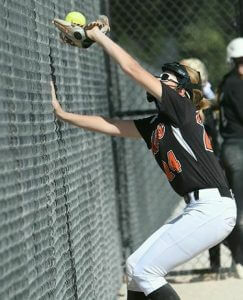 As a pitcher, I get angry about not having a fence, too. I am so discouraged when a cheap hit produces a home run that would be a double on a fenced field. It would not be fair if my pitching stats were negatively impacted because no fence stops the roll of the ball and the left fielder has to chase the ball 400 feet into no man’s land, then throw it in! "It would not be fair if my pitching stats were negatively impacted," Sadie says, "because no fence stops the roll of the ball and the left fielder has to chase the ball 400 feet into no man’s land, then throw it in!" I watched a varsity softball game in my hometown of Portland, Maine the other day. Both high schools play on the same field that is a true mens’ slow pitch field and although there is a fence, it is really tall and it must be around 300 feet deep. No high school girls hit a home run out of the park on this field. Ever. This means that the girls who play half their season here, have artificially deflated stats. But, in a few of the neighboring towns, those teams play about half their games on a fenced field and they get plenty of true home runs. Still, the girls have broken lights, a port-a-potty and lack parking. In the meantime, both baseball teams have the opportunity to play at the AAA ballpark for the Portland SeaDogs. I discovered that I don’t think it is a matter of just softball not getting respect in the Northeast, which is what I sort of felt when I started blogging. In this era of the #Time’s Up movement, girls’ sports in general are sometimes still disrespected and ignored and receive a lack of fair consideration. The discrimination against girls and privilege awarded to boys, in sports, is institutional and pervasive. In my neck of the woods, the evidence is that we don’t have fences (even temporary ones which is just ridiculous). It may not be the same symptom in other parts of the country. Maybe you have a fence on your field. But maybe your uniforms are old and tattered. Or, maybe you don’t get to have a gym to practice in or a bus to transport you to games. Fences (or the lack of them) in softball... it's not just a physical barrier sometimes, but a societal one too. But, it doesn’t make you seem like less of a player if you can still produce on the field. And without a fence, it is a different ballgame. I can’t compete with you in the stats. When I play on a fence with a field, I know that I can hit it out. I go up to bat with a confident mindset because I can see the goal and I know I can exceed that imposed limitation. When I see a field with no fence, I know that no matter what I do, it will not be enough: It is impossible to hit a true homerun without a fence. This sends a pretty lousy message to the players: the goal you seek is unattainable. If softball is life--and all players would likely agree that the ups-and-downs of life are played out during any softball game--then as a girl, having no fence on our field sends the message not just about softball performance and stats, but about life--no matter what you do, it won’t be enough, the goal you seek is unattainable. Give us a fence, and let us hit it over. We deserve better.